Spin each spinner – use the numbers that come up to make the larger number – for example – 1362 – children find the 1000 card, the 300 card, the 60 card and the 2 card – place on place value chart, underneath each other. Review the chart then slide the numbers to overlay in the appropriate columns to make – 1362 . DON’T FORGET – YOU CAN MAKE ALL OF THESE SMALLER SIZE IF LIKE – Make the size smaller for individual use by changing your printer settings for each page….to….’properties’, ‘page layout’ ‘2 in 1’ or ‘4 in 1’ etc. Could also use the laminated place value chart to draw on numbers using a whiteboard marker. Once number is made up – children could place groups of popsticks, base ten blocks etc to represent each column. Use ‘blutak’ to keep the ‘overlays’ together if demonstrating on an upright ‘board. 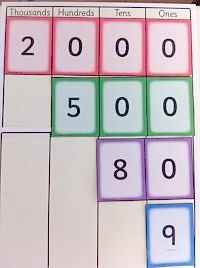 Use the number cards for other counting activities – for example – children use them to label groups of objects, display them for counting practice, write over the top using whiteboard markers for number writing practice, put them in correct order, for example – 100,200,300 etc. Use smaller individual copies for cut and paste number and place value activities.